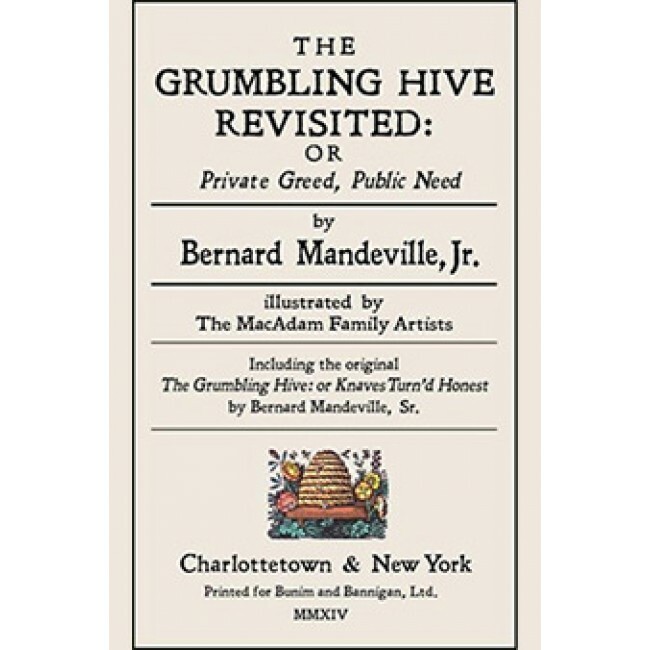 Bernard Mandeville’s The Grumbling Hive, or Knaves Turn’d Honest, published in 1705, is an exemplary product of a time when bold thinkers questioned verities that had appeared as solid as cathedrals and palaces: divine rights, sacredness, ‘it is because it is’. It was the beginning of the self-centered age we inhabit, overestimation of self and underestimation of everything else, Ostensibly about bees who "lived like men, and all/ Our actions they performed in small" it was really a fable about western European society. The grumbling in The Grumbling Hive was complaints that the trades and commerce that made the ‘bees’ thrive was everywhere infected by knavery, "sharpers, parasites, pimps, players,/Pickpockets, coiners, quacks, soothsayers. . . All trades and places knew some cheat. No calling was without deceit.” With villainy the norm, the fable device enabled Mandeville to precipitously introduce honesty and to show it freezing the wheels of trade; whole professions, lawyers for example, useless when none desired to obtain something for nothing; and locksmiths unemployed in the absence of burglars. These ideas inspired Adam Smith’s conceptions of supply and demand and the increase of wealth and how these were to be understood in the absence of morality. With confidence in the powers of reason it appeared possible to infer laws from observation, unhallowed laws, like gravity in which mathematical predictability substituted for the supernatural. Smith concluded that the Market, subject to the laws of supply and demand, automatically regulated commerce as if with an Invisible Hand. As he aged through the 20th century, Mandeville, jr. wondered what his ancestor would have thought of an unregulated laissez faire capitalism that countenanced selling packaged worthless mortgages to pension funds and found usury rather than production of goods the principle source of wealth. It occurred to him to start with bees not as living ‘like men,’ but as bees really exist, seeing the Hive as an example of socialism. In this case, the fable would recount not the introduction of Honesty into laissez-faire capitalism; but the introduction of laissez faire into socialism. He would be turning his ancestor’s fable on its head and perhaps, in the process, stimulate a vision that might alleviate the starvation, waste, environmental degradation and hopelessness of the twenty-first century. Why bees? Mandeville had a broad purpose and writing about bees lent a fabulous character to the enterprise as had La Fontaine with his fables, the fox and the grapes, for example, magnifying and simplifying motives. 1705: this was. The hinge was the preceding century, during which were scrutinized and mocked. Mandeville’s pamphlet of a dozen or so pages was pirated and sold on the streets of London for a ha’penny, probably equal to about $15 today. He issued new editions every few years, adding prose essays explaining in detail the way dishonesty and vice were necessary to prosperity; but they attracted little attention until his greatly expanded two volume, The Fable of the Bees, appeared in 1723. Now, heard loud and clear, Mandeville’s message generated denunciations in pulpits and parliament. To show the utility of vice, much less praise it, was counter the virtue-extolling message of religion; and Mandeville had gone so far as to condemn Charity Schools for the poor on the ground that it reduced the number of candidates available for the ill-paid dirty work on which the economy thrived. The Fable could not, however, be altogether dismissed. Mandeville had traced not only the fruitful manner in which cheating enhanced the circulation of money; but the way luxury and display created wealth. He saw regulations by government as encouraging monopolies and otherwise distorting trade. Leave it alone, Laissez Faire, was Smith’s watchword. (He did concede that in extreme cases the Market could without some regulation cause starvation and distress; but this has been largely ignored by the economic liberals who followed him, culminating in the so-called Chicago School under Milton Friedman.) A classic disciple of Laissez Faire was treasury secretary Andrew W. Mellon who advocated government inaction during 1930-32 when the great Depression created 25% unemployment. Socialism, of course, with its public ownership of property, is the opposite of Laissez-Faire capitalism. Paradoxically, however, one cannot find that any capitalist country has Laissez Faire engrained in its constitution or laws. When the United States was formed at the end of Mandeville’s century, a large concern of the 1783 constitutional convention was regulating commerce between the thirteen States that, heretofore, had impoverished each other , causing a constant threat of inter-State wars Article 1 section 3, gives Congress authority to "regulate commerce with foreign nations and among the several States and with the Indian Tribes.” Interpretations over the years have extended this power to affairs within individual states, and the creation of numerous bodies regulating communications, utilities, transportation, working conditions, agriculture, and almost every aspect of the economy.